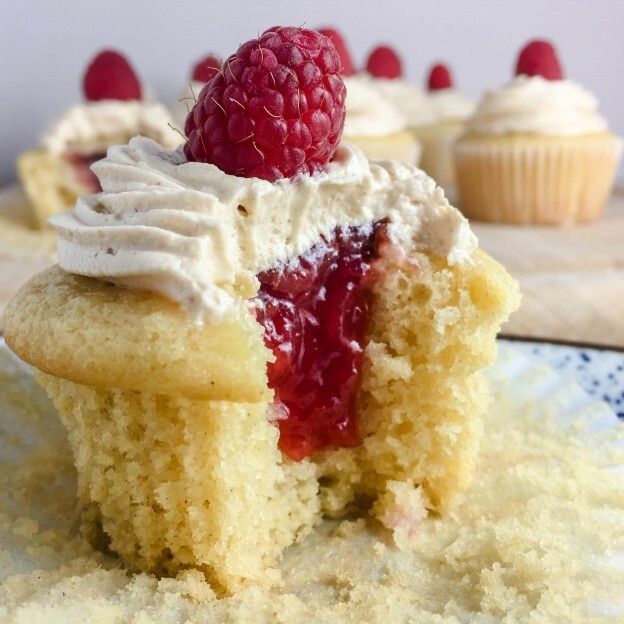 Peanut Butter and Jelly Cupcakes: small yellow cakes filled with organic raspberry preserves, and topped with Salted Peanut Butter Frosting. These sweet little vegan treats are sure crowd-pleasers, because honestly, who doesn’t like PB and J? Combine that flavor with cupcakes and you’ve got yourself a tasty dessert! The frosting is perfect because the peanut butter mellows out the sweetness of the frosting and is balanced with a pinch of salt. Feel free to use whatever your favorite jam or jelly is, mine has always been raspberry…with the seeds. If you enjoyed this recipe, sign up for Free updates. This entry was posted in All, Baking, Dessert on April 14, 2016 by melissa. 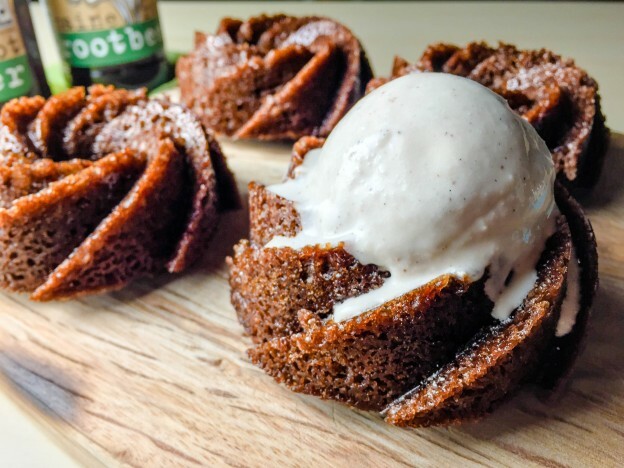 I was inspired to make these mini Root Beer Float Cakes by reminiscing over the Coca-Cola Sheet Cakes that I remember being pretty popular down in Georgia. They were the type of super-sweet-but-delicious cakes that would show up at potluck dinners or cake walks. These are just a miniature version of that classic southern Coca-Cola Cake, but made with less sugar, a bit healthier ingredients, and root beer instead of coke! Enjoy! This entry was posted in All, Baking, Dessert, Make-Ahead on April 5, 2016 by melissa. Some of my most vivid childhood memories involve family trips to Florida, where we would spend all day at the beach and the rest of the evening sitting on the screened in porches of seaside restaurants where my parents would enjoy a cold beer and we would all share tons of fried food. 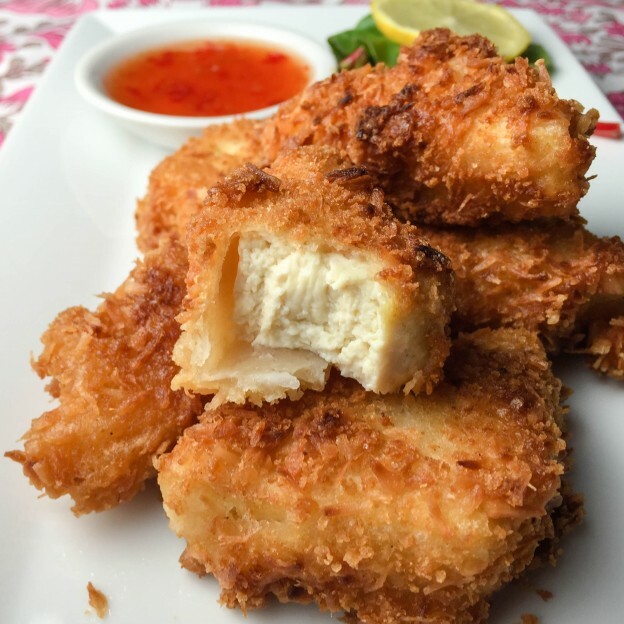 The flavor of this Beer Battered Coconut Tofu brings those memories right back. I’ve also got the recipe for a Horseradish Marmalade Sauce to dip these little nuggets in, but if you’d rather just buy a sauce instead of making one, go for a sweet chili sauce (probably any kind is good but my favorites are Grama’s Sweet Chili Sauce and Mae Ploy Chili Sauce). This entry was posted in All, Dinner on February 27, 2016 by melissa. These noodles are probably my favorite noodles ever. They’re super quick and easy to make and soak up the sauce so well. For this recipe, you’ll need wide flat rice noodles. Probably the easiest to find in your local supermarket would be these by Taste of Thai, but my favorite ones are the Pad See Ew noodles from Nona Lim. These are fresh rice noodles that come in a bag in Th refrigerated section of the grocery store, usually near the tofu. They have the perfect consistency and take only 30 seconds in boiling water to cook. The one’s from Taste of Thai are dried in a box, and take a little longer to cook, so read the directions on the package of noodles and allow yourself a little more time if using the dried, boxed kind. Definitely check out your local Asian market if there’s one around you though, you can probably to find some really good noodles there, and probably at a fraction of the price. 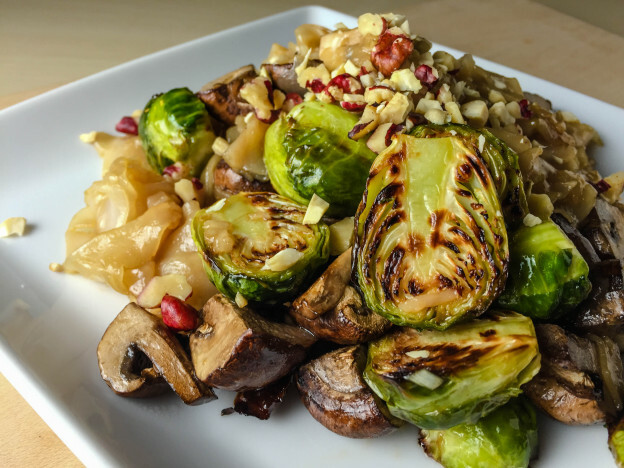 Use any of your favorite veggies, it doesn’t have to be brussels sprouts and mushrooms, just use about 4 cups total of whatever veggies you want, cut into bite size pieces. Add some baked Gardein Mandarin Chicken (or equivalent) at the very end in addition to the veggies if you want to really bulk up the meal and make it super filling. *Note: If you want to make this gluten-free, just use tamari instead of soy sauce. 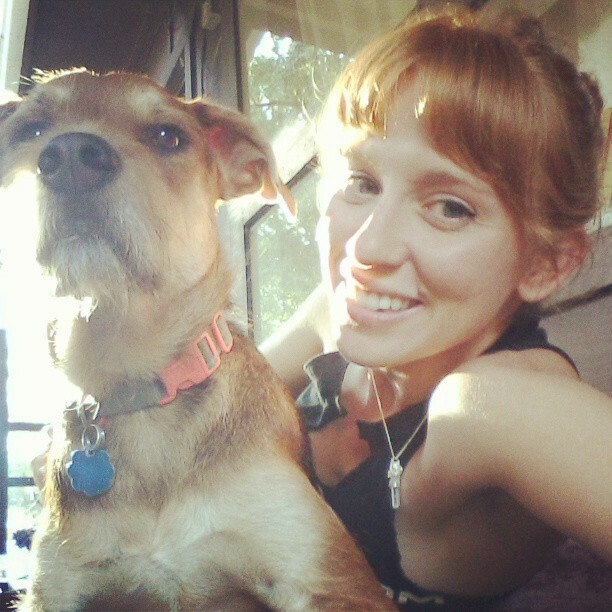 This entry was posted in All, Dinner, Gluten Free on January 14, 2016 by melissa. 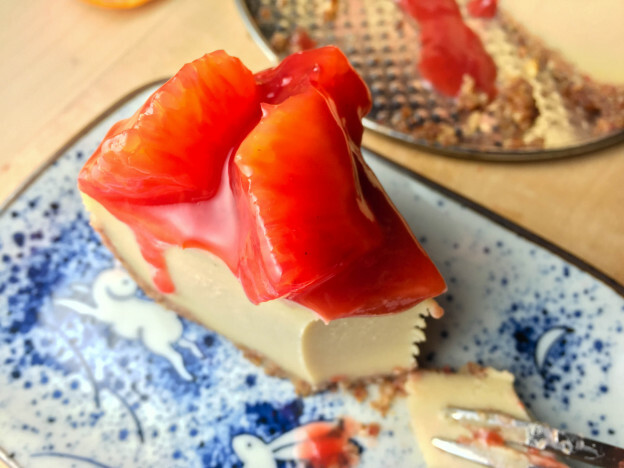 I have been experimenting for a long time trying to make a really firm, dense, yet still creamy vegan plain “New York Style” cheesecake. This is the closest I’ve gotten, but you can still taste the delicate flavor of Japanese sweet potato (totally a good thing just not what I was originally after). 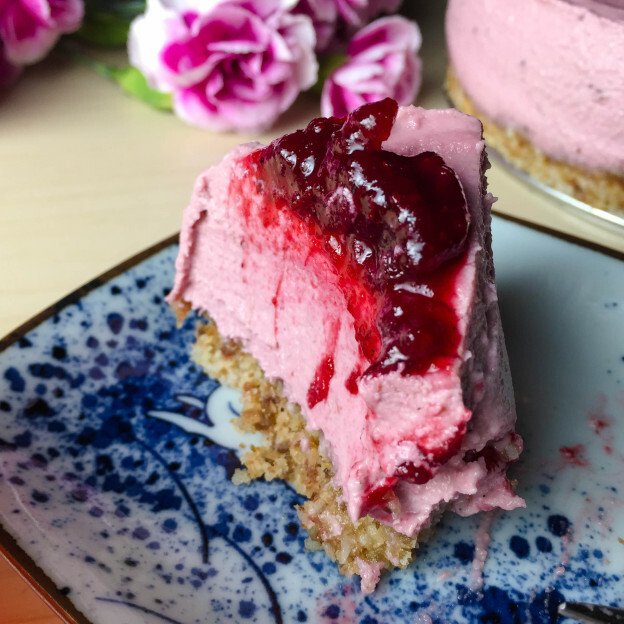 This cheesecake is honestly awesome just on its own, it is decadent yet firm, without being too heavy, it’s creamy and it’s velvety. You could eat it plain or put any kind of sauce you want on top, really. But the blood orange sauce just tastes so good with the earthy sweetness of Japanese sweet potato. This entry was posted in All, Baking, Dessert, Gluten Free, Holidays, Make-Ahead on January 14, 2016 by melissa. It starts with fresh-squeezed blood orange juice and cooks down into a sweet and zesty fresh dessert sauce. 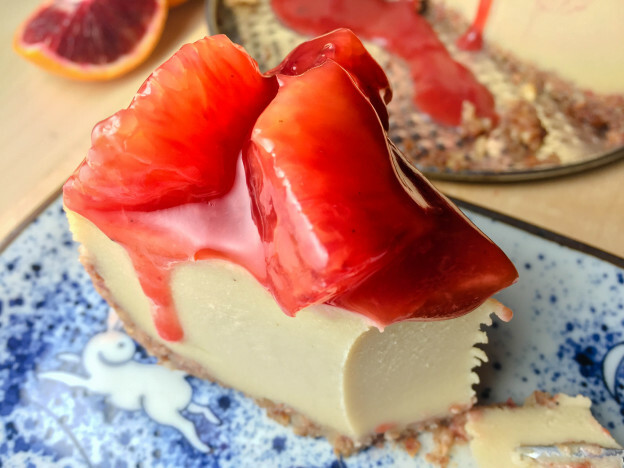 I originally made this to top a Japanese Sweet Potato Cheesecake, it would be amazing on top of pancakes or waffles in the morning…just saying. This entry was posted in All, Breakfast, Dessert, Gluten Free, Make-Ahead, Nut Free on January 14, 2016 by melissa. These are probably some of the messiest burgers I have ever made, like good messy, gloriously messy! 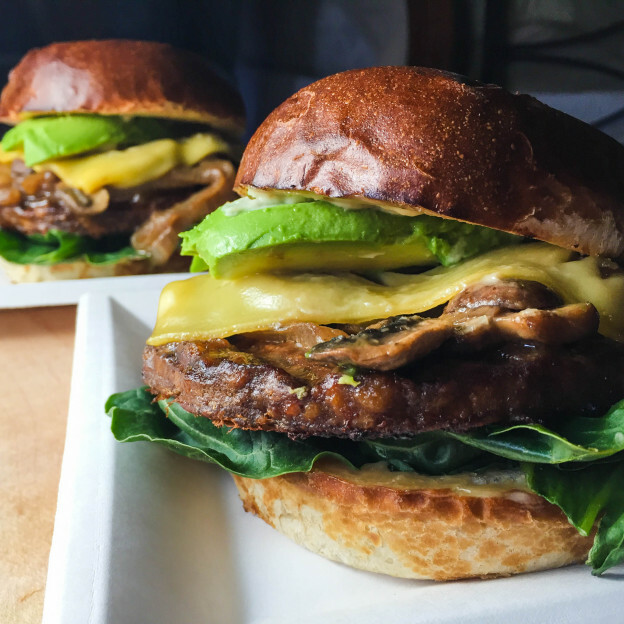 I used Beast Burgers from the company Beyond Meat, which are huge, then I smothered them with mushrooms and onions, browned in a miso glaze for the ultimate in umami flavor. I made a few slight alterations from the burgers pictured to make it less messy; like omitting the avocado on top, which I now deem unnecessary, and melting the cheese right on top of the burger instead of on top of the mushrooms will help everything stay together. Another trick to keep your buns from falling apart: be sure to put lettuce or some kind of greens on the bottom bun so all the juices don’t soak through and disintegrate the bread. Enjoy! And be sure to grab lots of napkins! This entry was posted in All, Dinner, Sandwiches on January 5, 2016 by melissa. Three reasons you should definitely make this: 1) Before it even comes out of the oven your whole house will smell like sweet pastry, hot apples and cranberry with cinnamon…it’s like what the ultimate holiday candle wishes it smelled like. 2) It is oh-so-perfect on a cold winter night with a big scoop of vanilla ice cream on top and a steaming mug of hot apple cider on the side. 3) It would be a good way to use any leftover cranberries you have from making other holiday foods. Also, you can make the cranberry/apple filling a day ahead of time, which relieves stress when cooking big holiday meals. This entry was posted in All, Baking, Dessert, Holidays on December 18, 2015 by melissa. As a Georgia-girl living in California, I find myself missing the South quite a bit. 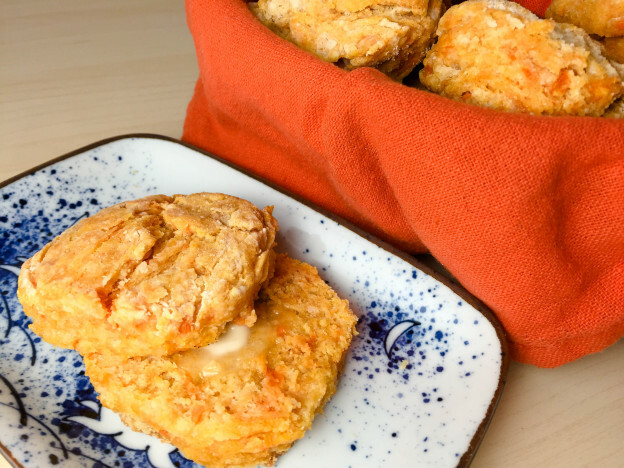 But there is something quintessentially Southern about a sweet potato biscuit, and it feels good to know I can always whip up a batch of these as a perfect reminder of my Georgia home. They’re fluffy but at the same time, the sweet potato keeps them really moist. They are best hot, fresh out of the oven, but if you have any leftover, just store them in the fridge and reheat when you’re ready. Top with some gravy, or butter and jam, or make yourself a breakfast sandwich! This entry was posted in All, Baking, Breads, Breakfast, Holidays, Side Dishes on December 5, 2015 by melissa. One of my mother’s go-to holiday recipes is Cranberry Pie, which is really simple and delicious. She loves to make it because it’s so easy, and everybody loves it because it’s perfectly sweet and tart, but also super light and airy; perfect for after a big holiday meal. Even people who say they don’t like cranberry sauce love her pie. I’ve taken all the elements of her’s, but used lots of whole-food ingredients, like dates, cashews, walnuts, and coconut. I like to make my own cranberry sauce, but if you’d like to save on time, the whole-berry cranberry sauce from a can or carton works just fine. This entry was posted in All, Dessert, Gluten Free, Holidays, Make-Ahead on November 21, 2015 by melissa. Georgia girl living in Northern California who loves to EAT! More important than that I love this planet and I love all the beings that live here, so I'm trying to help make it a more compassionate place. 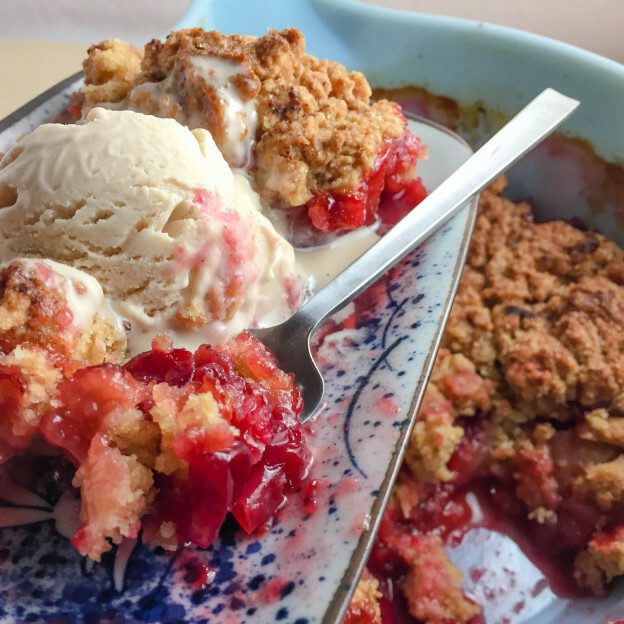 I'm hoping to inspire you to create flavorful Southern food (and other kinds of food too) using fresh, organic, plant-based ingredients, and maybe inspire you to think about some new ideas too. Eat Love Now is about living through the heart and enjoying thoughtful, kind, and delicious meals. Thank you so much for being here with me!